This is not a travel log entry in character, to be sure, though I drove 550 miles south from Dallas County to get here. I've bought a 'park model RV' in Alamo, Texas (not to be confused with San Antonio, where the Alamo is located), and I hope to like it down here enough to make this my home for a good while. The lower Rio Grande Valley of Texas--let's say the last 100 miles before the Rio enters the Gulf of Mexico near Brownsville)--is a semi-tropical environment where average morning lows in January are somewhere between 45 and 50 degrees--about 15 degrees or so warmer than El Paso and Dallas, the cities where I've spent most of my life. That is one of the big draws of this area for me: I hate to be cold, and my arthritis doesn't like it much either. Another draw is the border environment, like El Paso, a place I enjoyed living (though not in winter). And yet another draw is the available quality of RV parks--because so many 'snowbirds' come here for 3 to 5 months every year, the RV parks can be like little communities, more 'homey' than other areas like San Antonio and El Paso. If I like it as much as I hope to, this won't be just a winter home for me, but my actual home, except when I can afford to travel! (And if I'm lucky, living here will be inexpensive enough to allow for more travel before too long. A park model RV is not a travel trailer, fifth wheel or motor home: it's more like a tiny, one-bedroom mobile home, but its dimensions are planned so that it can fit on a lot in an RV park rather than the oft-maligned trailer park. I bought a 1984 model already set up in the park here. It's about 30 or so feet long and about 10 wide--I'm not positive of its exact dimensions. At one end is the living room, roughly a 10x10 foot square. Immediately next to it is the kitchen and dining area (also about 10 feet square), with no wall separating them from the living room. So this is the big open space of the RV. Then there is a short hall with a bathroom on one side and closets on the other. At the rear is the bedroom, with built-in cabinets and closets and just barely enough floor space for a full-size bed and space to walk around it. Mine has a full-length covered patio on the long west side, roughly the same side as the trailer itself. 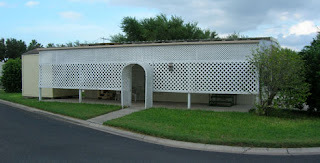 It has lattice work from about 3 feet above ground up to the eaves of the cover. Here's a photo. On the left side of the photo, you can see the shed, which was included with the RV. It contains a simple washer and dryer (very few settings on either) and some shelving units. The shed is much newer than the RV itself. The RV has a new roof because it suffered damage in Hurricane Dolly a few months back. Alamo is about 45 or 50 miles inland, so the storms are muted by the time they get here, with winds generally not much faster than a really bad dust storm in El Paso, some of which I sat out in a regular travel trailer! These two chairs are purchases I made for the trailer to replace a not-terribly old lounge chair and an older sleeper sofa. 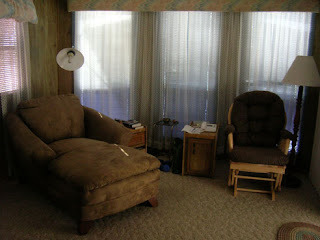 I brought the glider in yesterday afternoon from the furniture store, and the chaise lounge was delivered this morning. Unfortunately it came shortly after the park shut the water off, owing to a broken pipe somewhere, and the water is still not fixed, which is irritating. Today I was hoping to wash clothes, shower, things like that, for which water is essential. 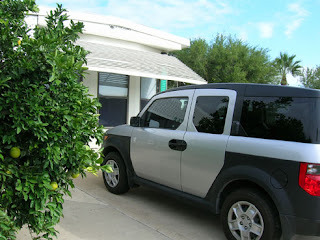 Here is a shot from the south end of the RV, showing the living room windows, the orange tree, and my Element parked in its new place. The RV came fully furnished--dishes, sheets and towels, furniture--but most of it I don't really want. So a good deal of it is going to a woman who lives here and has family in Mexico who can put it to use. Since I live alone, I don't really need plates, cups and bowls for 20! And since I don't do much real cooking, I really don't need a couple of dozen pots and pans either. I'm glad the things can be cleared out of here and put to good use. Wish me luck in my new environments, both microl- and macro-.